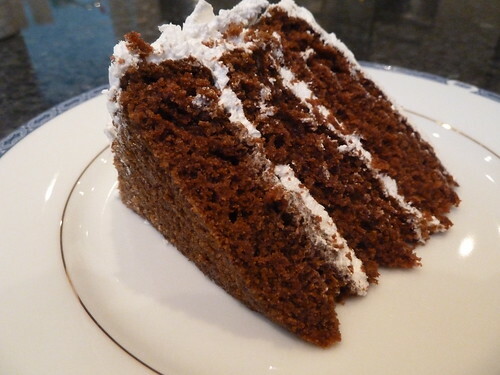 Devil's food cake is apparently so named because it is the counterpart to the the other classic American Angel food cake which is a light vanilla sponge. This is a moist and light chocolate cake - very much like a red velvet cake but without the addition of the food colouring to make it red. 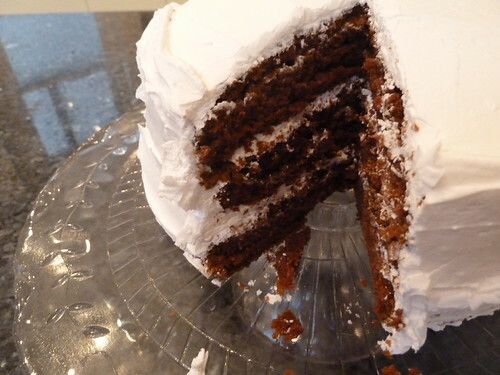 It is covered in frosting whether this is chocolate or vanilla is up to your preference. 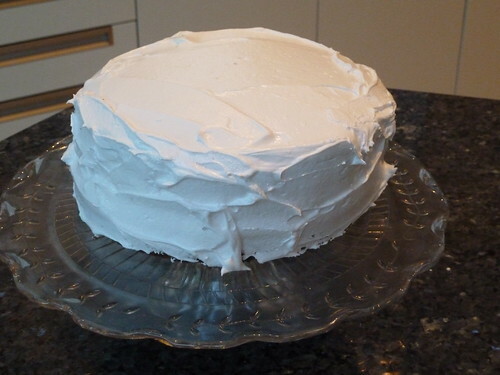 The recipe here is for a typical American style frosting which is a light marshmallowy frosting. Preheat the oven to 190 degrees centigrade (375 Fahrenheit or gas mark 5) and place some greaseproof paper on the bottom of the three sandwich tins lightly grease the rest of the tin. First break the chocolate into small pieces and put into a saucepan with 175mil of boiling water. Put on a low hob to melt down. Once melted remove from the heat and set aside. Beat the butter and sugar together until it is light and fluffy. Then add the eggs one at a time and mix together. Stir in the melted chocolate. Separately, mix together the soured cream and vanilla extract. Also sift the flour flour and bicarbonate of soda together. To the mixture add the soured cream and flour in three batches alternately. Mix between each batch. When all mixed together the batter is complete and should be divided until the three tins. Don't worry that the mixture is quite runny. Bake in the pre-heated oven (not on the fan setting) for 20-25 minutes. When cooked and springy to the touch cool briefly in the tin sand then turn onto a wire rack to cool. Put the sugar and water together into a saucepan over a low heat until the sugar has dissolved. Whilst this is happening whisk the egg whites until you have stiff peaks. Once the sugar has dissolved increase the heat. The sugar mixture has to get to 118 degrees Centigrade or 240 degrees Fahrenheit. Ideally use a sugar thermometer to check the temperature but if you do not have one boil it until it very slightly starts to darken in colour and drop a small amount of cold water into it and you should see it form a soft ball. Take the saucepan off the heat and add in a large pinch of cream of tartar and whisk until the mixture goes cloudy. Pour the syrup into the whisked eggs and whisk continuously. Keep whisking until the frosting thickens and loses its shininess. Spread a layer of the frosting on one of the cakes and sandwich another on top. Then repeat with the final sponge. Use the cake with the flattest top for the top sponge. Then cover the top and all of the sides in the frosting so that the cake is completely covered. You could decorate the top of the cake with chocolate curls or similar or just leave it as it is. Although there is a lot of frosting, American frosting is much lighter than butter cream and so it doesn't seem too heavy at all.